The Story: Lifelong friends Daveed Diggs and Rafael Casal co-wrote and star in this timely and wildly entertaining story about the intersection of race and class, set against the backdrop of a rapidly gentrifying Oakland. 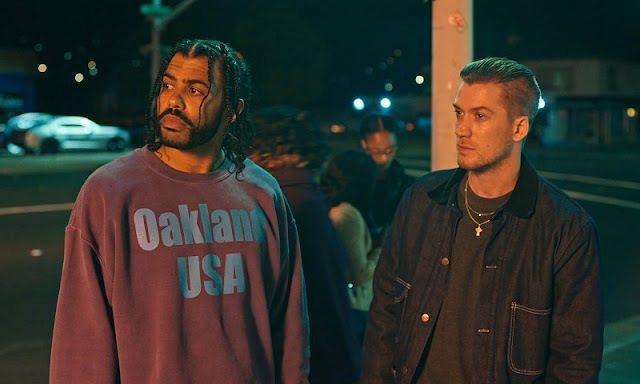 Blindspotting is a love letter to Oakland. It is a love letter to the Bay Area. It is a love letter to any neighborhood in the world that has a sense of identity and is in danger of losing it. It is a love letter to music. It is a love letter to hip hop and hip hop culture. It is a love letter to the struggle, the hurt, the pain, the reality, the loss, and the power of powerlessness in the face of oppression and so called progress. It is a love letter to strength, identity, friendship, and the brotherhood shared between two young men who couldn't be any more different yet are exactly the same. Daveed Diggs and Rafael Casal poured a lifetime of memories, experience, emotion, passion, creativity, and artistry into creating a story that will have a lasting impact on anyone who watches it. They have connected on something truly special by showing vulnerability and humanity in a world where there should be none. I connected with the story. I connected with it so much I cried twice the first time I saw it and three times the second time I saw it. I saw pieces of me in both of these men and the characters they brought to life. I saw authenticity. "You are a convicted felon, Mr Hoskins. You are now that, until proven otherwise. Prove otherwise at all times." That bit of dialog floored me and it's been on my mind ever since for several different reasons. Every moment of our lives carries a label, an identity, a brand, a story, a projection, an opinion, a perception, and a lie. "When you look at me, do you still see the fight first?" 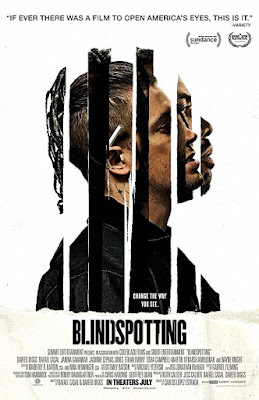 Blindspotting is about how people see us, how we want people to see us, and how those two things can be very, very different depending on who is doing the looking. One of the most interesting juxtapositions is during a pivotal moment of the movie that puts Diggs' character face to face against a police officer who is struggling with his own set of perceptions and perspectives. Ethan Embry's performance as the officer is so powerful and is so perfect in that particular moment and he leaves a huge impact with very little screen time. Blindspotting is a powerful drama that carries so much weight with Diggs and Casal doing all the heavy lifting through dialog that penetrates your brain and pierces your heart. There's an ebb and flow to every conversation and every word has meaning. Each phrase has an artistic flair that is part hip hop, part spoken word, part stage performance, part freestyle, part poetry, and presented in ways that add meaning and punctuation to every moment of every scene. Blindspotting is just as much of a comedy as it is a drama and director Carlos López Estrada perfectly balances the two for maximum effect. There's a verbal and virtual showdown between Rafael Casal's Miles and a hair salon owner played by the one and only Tisha Campbell-Martin that had me laughing and hanging on every word and another that featured Miles attempting to sell a boat to a big money baller by using so much slang that even he ended up having no idea what was being said. The beauty of these moments is in the quality of the writing which makes them mean something and move the story forward rather than just being there for a cheap laugh. Blindspotting is one hundred percent Oakland. The streets, the talk, the music, and the walk. From Mac Dre to Kwik Way, people that know the Bay will see this in every frame of film, every street sign, and every bit of dialog. You can tell these two artists share a bond that has been shaped over time and through tribulations that have put them so close together they nearly become one yet fully retain their expressiveness and individuality. Blindspotting is a soundtrack for the city that includes the aforementioned Bay Area legend Mac Dre and is filled with Oaktown sounds and beats that match the streets and the rhythms of the story. Easy Come Easy Go, in the video below, is the first rap song to make me feel real emotion in a long time. It's beautiful in its simplicity and stunning in its complexity and perfectly complements the movie.